There are several manufacturers rethinking how cameras might remain relevant in a smart phone world. Sony is one of them, with two new lens designs developed to work with smart phones. All you have to do is attach them or not. With the NFC/Wi-Fi connection, they work together regardless. The more accessible solution transforms your phone into an 18MB camera. The other transforms it into something comparable to a DSLR camera. The price difference between the two is steep, about $250. I tried the former, but not the latter. Between the price points and where the product seems to be in its development timeline, trying the QX10 first felt like common sense. For the price that Sony set the QX100, the more advanced smart lens is competing with some standalone DSLR cameras. The QX10 by Sony shoots better than bare. The long and short of the QX10 lens is that it is comparable to a mid-range point-and-click camera sporting an 18.9 megapixel sensor. This is significantly bigger than most built-in smart phone lenses. It also provides a 10x optical zoom with very little distortion. Other bonuses include that it is equipped with Sony's image stabilization features, exposure compensation (+/- 2.0 EV, 1/3 EV step), and built-in white balance. It can also record MP4: 12M (1440x1080, 30 fps). The stereo speaker is built into the lens. Some people like the video better than the stills. The camera attaches to the smart phone via an embedded bayonet mount. The mount can be adjusted, accommodating most phones and cases. The grips are rubber so there isn't much fear of damaging the phone. Counting the mount, the lens extends about 1.5 inches off the back of the phone. You can use the lens without the phone, but there aren't many physical controls or a viewfinder. With exception to the basic functions, the lens is largely operated by Sony's PlayMemories application. Mostly, it feels awkward unattached, like trying to line something up in a mirror. The one exception is when the lens is set on a tripod for a static shoot or, with proper planning, a nice self-portrait or shot with friends. Overall, the image quality is largely better than the smart phone but not always on par with comparable cameras. I noted some overexposure issues on occasion. Low light shots were particularly muted. The low light shooting was especially bothersome to me. The lens does not include a flash nor will it work with the smart phone light. One solution might be to turn the light on and then launch the application, but this won't work with an iPhone. The bottom line is that it is better, but I'm not sure it's always better enough. Much like other reviewers have noted, it seems close to a stripped down Cyber-Shot DSC-WX150 with Wi-Fi. You see, the side-by-side specs look similar, but performance varies. This lens requires some patience. There is a delay between turing everything on and connecting to the smart phone, anywhere from 5 to 15 seconds after the initial setup, and the irritation of a lost signal or depleted battery. The lens relies on Sony's PlayMemories application. Sometimes it's difficult to tell whether or not the performance is a hardware or software issue. The app itself is straightforward. There is a zoom toggle and shutter release (which can also be operated from the lens) as part of the viewfinder. The settings include an autofocus, advanced autofocus (e.g., macro, etc. 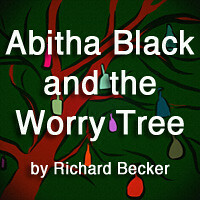 ), and white balance. All in all, it's a point-and-shoot camera that, in terms of working with the iPhone, takes advantage of a tap-screen focus but not everything iPhone owners have become accustomed to. Sony seems to know it too. It released the API and is hoping third-party apps will take an interest. Right now, however, even sharing photos to places like Instagram or Facebook means closing the PlayMemories app and then uploading the photo from the smart phone library (where photos are saved in addition to the microSD card in the lens). The QX10 Lens By Sony Steps Up At 4.2 On The Liquid Hip Richter Scale. The first time you see the QX10, it's hard not to become excited. It looks and feels like a glimpse into the future, one where smart phones are armed with an arsenal of hardware to make them even better. 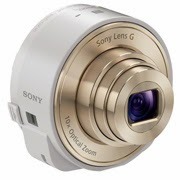 In that regard, the Sony QX10 is a step in the right direction even if the camera feels first generation. As third-party applications become readily available, I expect the lens will become a hero for doing its primary job — providing better than smart phone pictures without requiring you to carry around another camera and accessories. Both the QX10 and QX100 come in black and white (and gold). 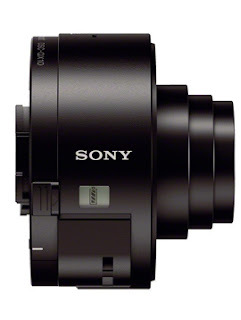 Look for the Sony QX10 4.45-44.5mm Smart Lens on Amazon.